Brighton and Hove Albion’s search for a striker seemed to go on for longer than a Leonard Cohen song. Four transfer windows ago in the summer of 2016 we were desperate for at least one new centre forward. Looking back at it, the fact we managed to get through our promotion winning campaign with only Glenn Murray, Tomer Hemed and Sam Baldock while playing two up front was somewhat of a miracle. The need for reinforcements became even more acute last summer. Of those three senior strikers, only Murray had played Premier League football before. We were short on both quality and quantity. Nobody arrived however and when Murray and Baldock were injured at the same time and Hemed suspended, we had no available centre forward, which led to the sight of Izzy Brown operating as a false nine or whatever you wish to call a big fat zero in the strikers bit of the formation. Signing a striker in this window was vital to the Albion’s chances of staying up and just like the proverbial London Bus, you wait ages for one to come along and then two arrive within a week of each other. Leonardo Ulloa needs no introduction after his first spell at the club in which he fired the Albion into the Championship play-offs in consecutive seasons. He has done it in the Premier League as well, hitting double figures in the year Leicester stayed up under Nigel Pearson and then popping up with some vital goals in that most unlikely of title triumphs. Ulloa brings proven top flight quality and should thrive on a side who play with out and out wingers and get crosses into the box. More of a gamble is club record signing Jurgen Locadia from PSV Eindhoven. His scoring record in the Netherlands is decent enough but then so were the likes of Vincent Janssen, Ricky van Wolfswinkel and our own Dutch disaster Elvis Manu, who left the building just 18 months after being signed for £1.5m. Both Ulloa and Locadia need to hit the ground running for the side that were the Premier League’s lowest scorers before the win over West Ham United. 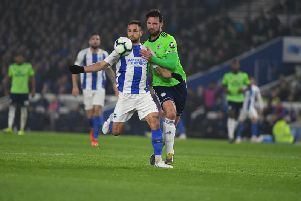 Their arrivals seem to have had the added bonus of spurring Murray into an outrageous run of form as his place comes under serious threat for the first time at the Albion since he was battling with Liam Dickinson to partner Nicky Forster in League One. Given our recent trials and tribulations in defending set pieces recently (that’s a whole other column waiting to be written), we can’t rely on clean sheets and 1-0 wins anymore. Goals are what will secure Premier League football for next season, and the club look like they’ve done everything they can to give Chris Hughton the ammunition to go and get them. As the (new) Ulloa song says, we don’t need a striker anymore.